My mother-in-law understands my long-standing love of baking. A few years back she gave me this recipe book which is wholly dedicated to baking ooey-gooey, yummy treats -and this little guy's number finally came up. 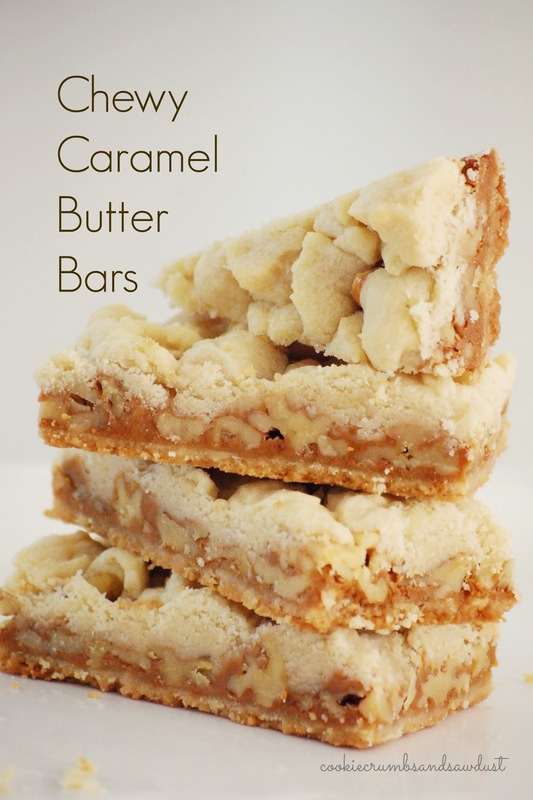 If you don't like caramel, shortbread, or nuts, this butter bar is not for you. I love these Gooey Chewy Caramel Butter Bars. They were easy to make and man, they were good! In a large bowl, combine the butter and sugars. Using an electric mixer set at medium speed, beat together until creamy. Add the vanilla and salt and beat until combined. Sift the flour into the butter mixture and beat on low speed until a smooth soft dough forms. Spray a 9×13 inch baking pan lightly with non-stick cooking spray. Press one-third of the dough evenly into the pan to form a bottom crust. Pat the remaining dough into a flat disk and wrap in plastic wrap and refrigerate until firm, at least 30 minutes. Position a rack in the middle of the oven and preheat to 325F. Bake until firm and the edges are a pale golden brown, 20 to 25 minutes. Transfer to a wire rack and let cool. While the bottom crust is baking and the remaining dough is chilling, make the caramel filling. Place the unwrapped caramels in a microwave-safe bowl. Add the cream, rum (if using), and salt. Microwave on high for 1 minute. Remove from the microwave and stir until smooth. If caramels are not completely melted, microwave on high for 30-second intervals, stirring after each interval, until smooth. Sprinkle the nuts, if using, over the bottom crust. Pour the caramel filling over the nuts, using a small metal spatula to nudge the filling evenly over the crust. Remove the remaining chilled dough from the refrigerator and crumble it evenly over the caramel. Return the pan to the oven and bake until the filling is bubbly and the crumbled shortbread topping is firm and lightly golden, about 30 minutes. Transfer to a wire rack and let cool completely. Use a sharp knife to cut the bars evenly into 15 large squares. Remove the bars from the pan with a metal spatula and, if desired, cut in half on the diagonal to form 30 triangular bars. Dust with confectioners’ sugar, if desired. The bars will keep, covered tightly at room temperature, for about 1 week, or in the freezer for up to 1 month. These bars ship beautifully. After I baked a batch, I realized they would be sturdy enough to ship. And they were! I mailed a box of them across the country, from Boston to Salt Lake City, to my mother-in-law. When she received them, she said they were perfectly intact and delicious. In fact, she called me while eating one, her mouth-full, to tell me how great they were. Love that woman! The holiday season is coming up. What's your go-to shipping treat? *This post contains an affiliate link. Don't worry, you pay the same price, but I get a tiny commission. And I only include links of products I use and love and really want to share with my friends. These look AMAZING. There are no words to describe how hungry I am now. Those look great. I'm going to have to make those- soon. These look so good! That filling sounds HEAVENLY!!!! Nice! And no chocolate! I'm so wanting to try these!!! I pinned this. It looks scrumptious. Visiting via Silly Girl. Stopping by to let you know your caramel bars are featured on Made in a Day today! Congrats and thanks for linking up!